Being an Entrepreneur is a way to view the world. 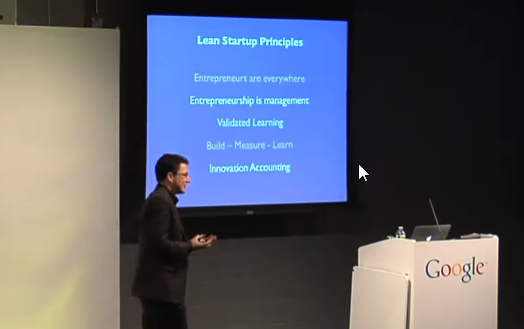 Eric Ries points out that being an Entrepreneur is about being able to conduct defined Experiments. In his Book “How Today’s Entrepreneurs Use Continuous Innovation to Create Radically Successful Businesses” he insits that it is mission critical to make the smallest possible, yet viable experiments in order to strategically develop a product. Interestingly enough, there is significant overlap with Tim Ferris “Hackable Life”: Ferris also puts huge focus on setting each drug to its perfect dose. He observed that people tend to invest significant power into ineffective, yet efficiently conducted work. Try to test your idea with the minimum possible effort. In short, the lean startup model focuses on getting a minimum viable product to the market, then receiving customer feedback along the way to improve the product and pivot (take a new approach) if necessary. This, of course, is in contrast to the old way of doing business where a product is launched fully functional backed by extensive market research. This method can be successful, but it costs a lot of money, pivoting is difficult, and failure can harm the bottom line (think Microsoft Vista). Lean Startup discusses macro level strategies to improve the likelihood of viability of new products and services. Moving away from the more rigid academic approaches that are largely finance oriented, Ries takes a market oriented approach and demonstrates with numerous examples how flexibility and testing based on data are key to determining real not “believed” market needs and the extent to which those needs are commercializable. Reis also recognizes that his approach is for the early part of a product/company life cycle and that, once established, product redevelopment should follow a similar path in the face of market competition. Myth 1: Lean means cheap. Lean startups try to spend as little money as possible. The reality is the Lean Startup method is not about cost, it is about speed. Lean startups waste less money, because they use a disciplined approach to testing new products and ideas. Lean, when used in the context of lean startup, refers to a process of building companies and products based on lean manufacturing principles, but applied to innovation. That process involves rapid hypothesis testing, learning about customers, and a disciplined approach to product development. Actually, the Lean Startup methodology applies to all companies that face uncertainty about what customers will want. This is true regardless of industry or even scale of company: many established companies depend on their ability to create disruptive innovation. Those general managers are entrepreneurs, too. And they can benefit from increased speed and discipline. There’s nothing wrong with raising venture capital. Many lean startups are ambitious and are able to deploy large amounts of capital. What differentiates them is their disciplined approach to determining when to spend money: after the fundamental elements of the business model have been empirically validated. Because lean startups focus on validating their riskiest assumptions first, they sometimes charge money for their product from day one – but not always. This focus on size also obscures another truth: that many entrepreneurs live inside of much larger organizations. As I’ve written elsewhere, I believe the proper definition of a startup is: a human institution creating a new product or service under conditions of extreme uncertainty. In other words, any organization striving to create disruptive innovation is a startup, whether they know it or not. Established companies have as much to gain from lean startup techniques as the mythical “two guys in a garage” (and, as I’ve witnessed in my consulting practice, sometimes even more). Truth: Lean startups are driven by a compelling vision, and they are rigorous about testing each element of this vision against reality. They use customer development, split-testing, and in-depth analytics as vehicles for learning about how to make their vision successful. Along the way, they pivot away from the elements of the vision that are delusional and double down on the elements that show promise.